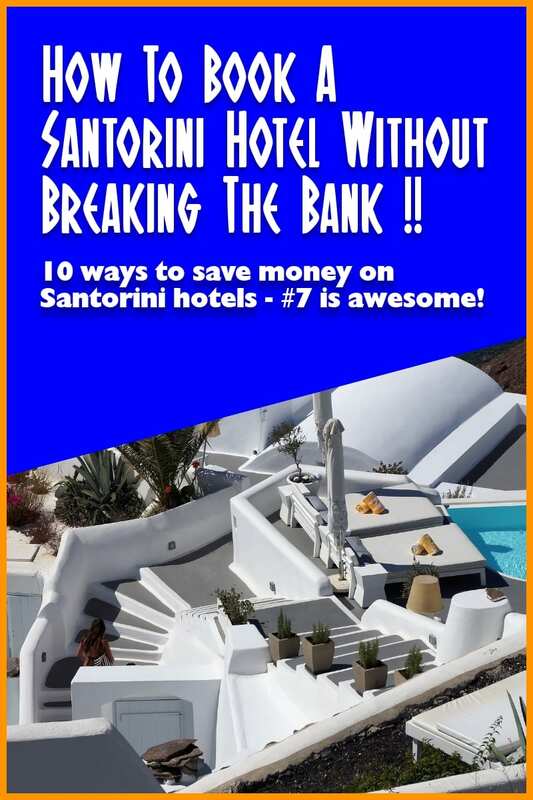 10 ways to save money on Santorini hotels, and why not to use AirBnB. Here's how to book a Santorini hotel without breaking the bank. Santorini has gained a reputation as being an expensive destination in Greece. The island’s popularity and relatively small size, means that hotel prices can rocket, especially in high season. But, Don't Panic! It's entirely possible to book a Santorini hotel without breaking the bank. Read on for tips and ideas to make your stay in Santorini affordable. I have written about this before, and can’t stress it enough: avoid Santorini in July and August. These are the peak months, and not only do hotels fill up quickly or have high prices, but there are other tourists everywhere! Obviously, if this is the only time of year that you can take time off, by all means go. Just keep mind that May, June or September are much better choices when it comes to cheaper accommodation in Santorini. I visited Santorini in mid-November a couple of years ago, and while I didn’t go swimming myself, other people did. Plus, the weather was very pleasant when we walked up the volcano. At that time, we had only paid around 30 euro for a very decent double room with great breakfast, and we really enjoyed ourselves as the crowds were gone. We even had the hiking path from Fira to Oia to ourselves! My full guide here to the best time to visit Santorini. Chances are that if you are coming from abroad, you will have booked your flights to Santorini months before you travel, especially if you are visiting in peak season. As accommodation prices eventually go up, and the cheaper places go early, there is no reason why you should delay booking your hotel. My advice – start searching for a hotel in Santorini as soon as your flights are booked. Santorini would make a lovely weekend break – if only hundreds of other people didn't have the same idea! In general try to go mid-week as hotel prices in Santorini might be lower. Sure, the sunset over the volcano is something you must see at least once. And you might think having a Santorni hotel with pool and sunset view is the perfect combination. It does come at a price though. If you are planning to be out all day, or take any Santorini tours, there is no point in paying extra for a hotel with sunset view. 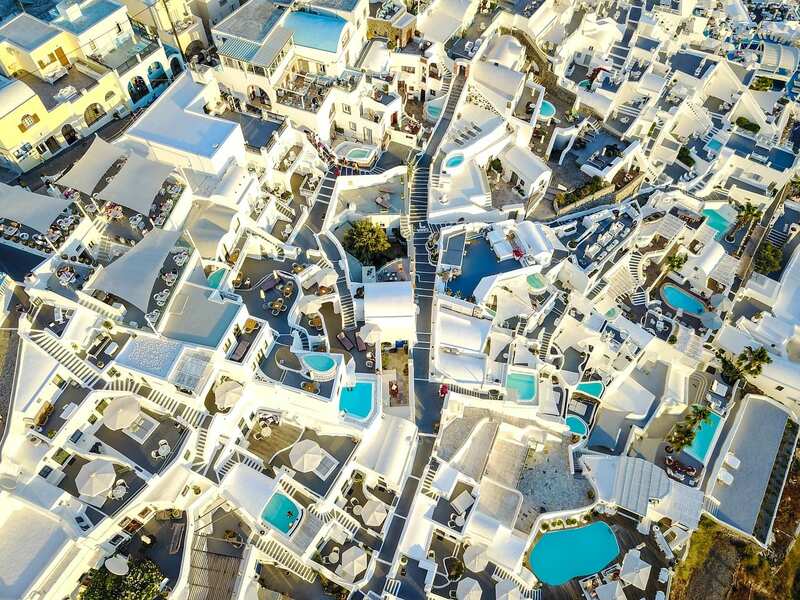 Fira, Firostefani, Imerovigli and Oia are all areas with a view of the sunset, and are therefore pricier. Instead, opt for accommodation on the east side of the island, where you will practically be on the beach and where you can also see the sunrise if you are an early morning person. Kamari and Perissa are great for budget accommodation, especially off-peak season – you can find several rooms for under 30 euro a night in May. Budget travel and Santorni are rarely words used in the same sentence, but backpackers are more or less catered for. So, if you are travelling on your own, or if you don’t care whether you have a private room, you can always go for a dorm. This will generally be a cheaper option, especially at peak season. However, if you are two or more people travelling together, you might find that a private room might actually be the same or even better value. Check out www.hostelworld.com for dorm options – there are a few hostels on Santorini. While my personal preference when travelling is www.booking.com, there are several other search engines that you could consider. Some examples are www.agoda.com, www.hotelscombined.com, www.hotels.com, www.trivago.com, www.priceline.com and www.kayak.com. You might find that the hotel you like is sold out on one search engine, but it’s still there on another one. Also, the price is often different on different search engines. If you have enough time to search, it’s worth giving it a go. When you find a code, all you need to do is click on the link. You should see a screen on the next page that informs you of the discount you will get. Not all properties are eligible, but for the most part they are. I know that in this day and age a call sounds very old-fashioned, but if you are good with words you can try to email or even call the hotel, mentioning the price you have seen online and asking for a small discount. Since hotels pay a hefty commission (often around 20-25%) to search engines, which are then included in the total price you are paying for your room, they should be able to give you a small discount. It doesn’t hurt to try. While I don’t recommend this option if you are travelling with a family and/or at peak season, this is something you can do if you are island-hopping around Greece off-season. Chances are that you will always be able to find a cheap room that you wouldn’t have found online, but you might need to look for it for a couple of hours. If you visit Santorini and want to stay longer, it would be worth asking around if there are any jobs. Don’t expect much in terms of choice, but if you want to extend your holiday it’s an option worth considering. I spent a couple of months on a different island, Kefalonia, picking grapes, with accommodation and food (and wine!) provided, and I managed to put money on the side. 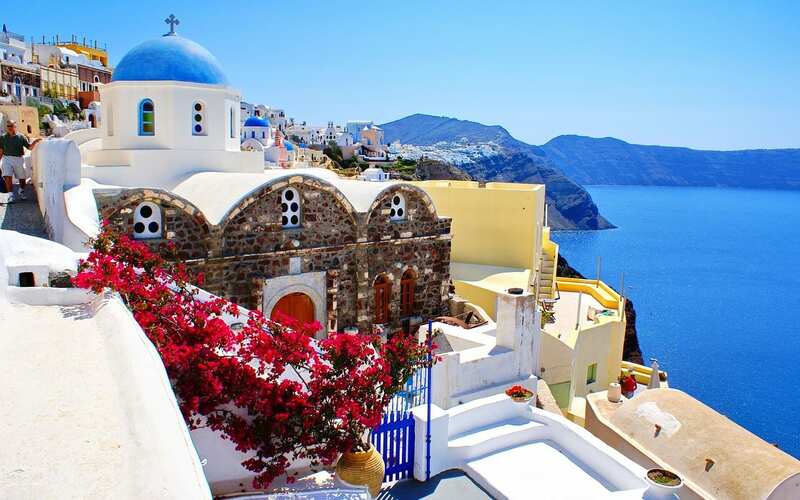 Hint – Santorini has plenty of wineries. Finally, you will have seen that AirBnB is noticeable by its absence in this article. The truth is that AirBnB is actually causing problems for people like Greek doctors and teachers who need to stay in Santorini for professional reasons longer than a few days. I have heard of cases where a teacher had an annual contract for an apartment starting in September, but they were asked to leave when high season started. They found it impossible to find somewhere else to stay at a price they could afford. Not only were prices sky high, but if you thought that teachers salaries were bad in your country, you can only imagine how low they are in Greece! So, while AirBnB is often preferred by tourists, I personally don’t endorse it, especially for popular destinations like Santorini. Most of these tips apply for any destination, so next time you book a hotel anywhere in Greece or the rest of the world, check them out – and feel free to share this article with your friends. If you found this Santorini travel guide useful, you might also be interested in my other travel guides to Greece. Just sign up below, and I'll send them out to you.